Find leaves outside to collect and glue to construction paper to make a book. Too cold to go outside? Go on a scavenger hunt inside and find all of the items in your home that are black and orange! 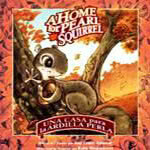 How many orange and black leaves can you find in A Home for Pearl Squirrel?